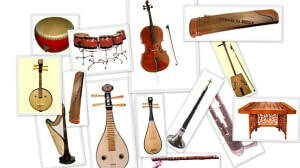 Guzheng (zither or lap harp) was a very popular instrument during ancient times, as early as the Warring States Period. The zheng has an arched surface and is elongated-trapezoidal with 13 to 21 strings stretched over individually movable bridges. The zheng rests on two pedestals and is played using 3 to 4 imitation fingernails. On the right side of the bridges, both hands pluck the strings and on the left side, the left fingers bend the strings to change pitch or to provide embellishment. Its playing range spans three to four octaves. It is a pentatonic instrument. Different techniques of playing the guzheng can create sounds that can evoke the sense of a cascading waterfall, thunder, horses’ hooves, and even the scenic countryside.